iTunes Won’t Transfer/Sync Music to iPhone 8? 100% Fix Here! Do you keep trying to sync your iPhone 8 with iTunes, but the music just won’t transfer? Are you only getting some songs, but not others? This happens to a lot of people, actually. In the worst cases, some people can’t transfer any music at all. Luckily, there are some solutions, so don’t worry. There are many reasons why you may find yourself unable to transfer music to your iPhone 8. Sometimes, it’s a physical problem, like a stable USB connection or a bad USB port. Other times, it can be an issue with the network connection, since iTunes needs a network to be able to transfer files. 1. Check your USB cable If your USB cable is brand-new and comes with your iPhone 8, you can skip to next solution. 2. Try multiple USB ports on computer. 3. Make sure that the network adapter on your computer works. If it is an external, removable one, try swapping it out. At the very least, check to make sure you have a network connection. How to Bypass the Error "iTunes Won't Transfer Music to iPhone"
If you’ve tried seemingly everything and you still have a problem, then you might want to bring in a third-party alternative. A really good file transferring application for iOS devices is iMyFone TunesMate iPhone Transfer. It basically replaces iTunes and even lets you add songs to your library or transfer songs from your library without having to open iTunes at all. 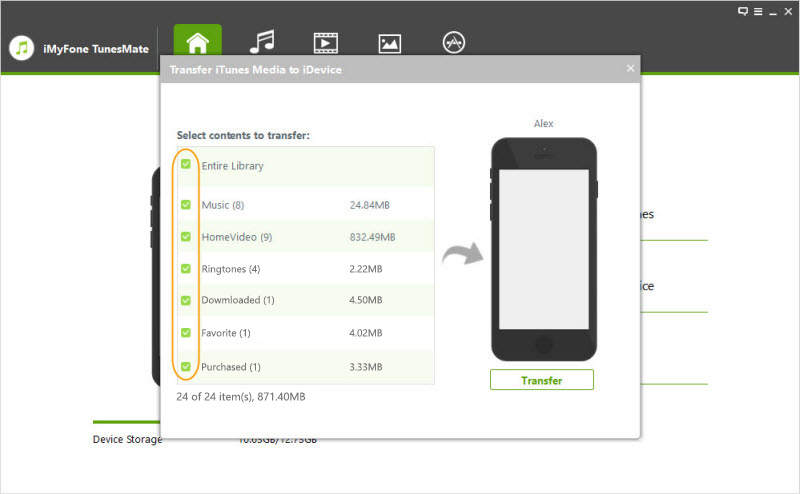 Transfer just about any kind of media file, even if you didn’t purchase it from the official store. Two-way transfer: from computer to iPhone, or from iPhone to computer. Sync iTunes library to iPhone without any damage to the existing library on iPhone. Transfer music to iPhone directly from computer or external hard drive, instead of going through iTunes library. Share purchased or non-purchased music with your friends, even if you have different Apple IDs. TunesMate is chosen as the great iTunes alternative to transfer files, by Geekreply, tricksworldzz.com, etc. Step 1: Download and install TunesMate to your computer. Connect your iPhone 8 to your computer as well. Step 2: Open up TunesMate and then click where it says Transfer iTunes Media to iDevice. Step 3: Select what kind of files you want to transfer, then click Transfer. After it is done, click OK. It’s that simple. Step 1: As before, make sure that TunesMate is installed to your computer, then connect your iPhone video the USB port. Step 2: Open up TunesMate and click the Music tab. 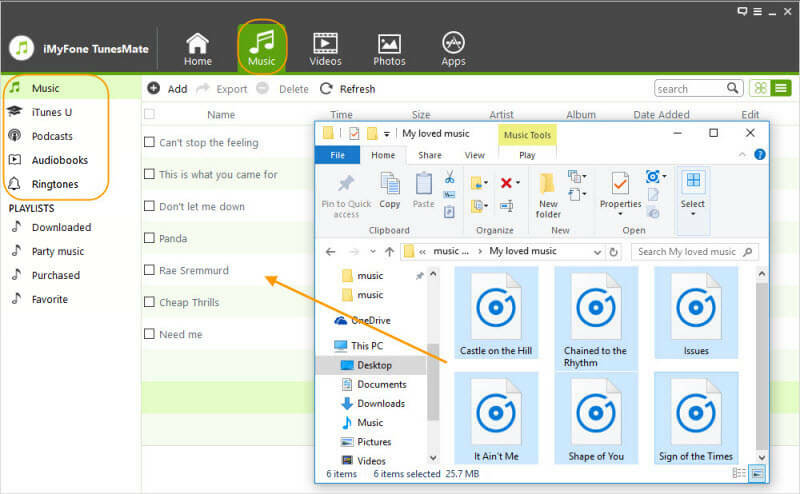 Step 3: Simply open up a file browser on your computer and look around for the music that you want to transfer. Now you can just drag and drop it to the main part of the window (that contains the list of music already on your device), and TunesMate will automatically start transferring.